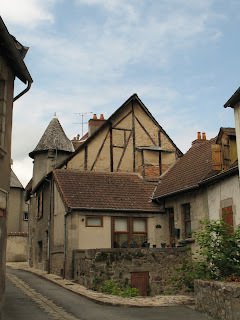 On Tuesday morning our minibus picked us up for our first visit to Aubusson, a forty five minute journey through the town of Bourganeuf and pretty country vistas interspersed with a couple of tiny roadside villages. Susanne Bouret was waiting at the old train station car park. The train service stopped many years ago but the Gare Routier sign is still there as though waiting to be reawakened. It was wonderful to see her again, a moment I had really been looking forward to. After the many introductions we set off on our excursion over the Pont Neuf bridge, crossing a little arm of the Creuse River that winds through the town. Although this picturesque town has survived on the weaving industry since the 14th C. and its many individual ateliers have been open to public view for decades, Susanne explained that in the last twenty years production has declined due to the poor economic climate and the fact that many weavers have reached retirement age without a generation of younger people to follow them into the craft. However, in 2009 Aubusson and Felletin tapestry received the title of "Intangible Cultural Heritage" from UNESCO to try to save and regenerate the art form and inject some new energy into its practice. Our first visit was to Atelier 2, run by France - Odile Perrin-Criniere and Martine Stamm. Their studio is behind a well designed shopfront exhibition area which displays many of their tapestries in a great variety of form, colour and sizes. They also run classes in this bright, airy space. What interested us most was their practice, tucked away behind the shop. And so began our conversations, with Susanne's expert translations that interpreted every nuance of our questions and their answers, building a bridge of understanding and camaraderie between weavers, establishing and reinforcing the "common language" of our chosen craft. Everyone, without exception, was generous with their time and tremendously patient with the process. Because it was my second visit to them, our communication was a lot more "chatty". We agreed about the nature of contemporary architecture's propensity to discourage tapestry commissions as these days the buildings are considered sculptural works of art in their own right with feature walls that are curved and shaped or incorporate decorative elements into their design. As hardworking artist/weavers they were also amused at the slow rate of production expected of the weavers at the Gobelins, and had read that that it took them three months to dye a single colour! France-Odile was working on a large, commissioned tapestry in low warp technique (as do all the Aubusson weavers). It was a many hued abstract design that she had first painted in gouache, then manipulated through a computer program and finally printed as her cartoon that lay beneath the finely warped loom. We were always amazed at the rigours of the low warp technique - the fineness of the warp settings, the proliferation of bobbins used and the back breaking technique of weaving complex imagery from the back of the tapestry, using mirrors poked between the warp threads to examine the front. Martine was also at work in the studio on a photoshopped version of Monet's bridge at Giverny. The colours were quite bizarre and she found it a difficult exercise capturing the fluid nature of the artwork in woven form. 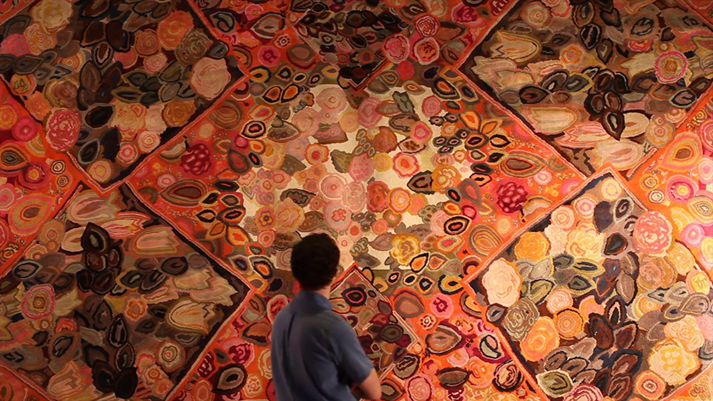 She often works on vibrant pieces in collaboration with her husband, a sculptor in granite. In these works the hardness of the etched and polished stone sets off the soft, colour saturated wool. We walked across the cobbled streets to meet master dyer, Thierry Roger, the only one left in Aubusson. It was the craft of dyeing that had brought tapestry to Aubusson all those centuries ago, aided by the chemical composition of the Creuse. He inhabited a small, open dwelling which had seen a lifetime of use, every surface testament to accretions of colour. It was hot work on a warm day as he raised and lowered the steaming hanks into a dye bath, checked them and infused them again. He had everyone in thrall as he guesstimated the smidgeons of colour to be added to the heated baths and dipped the the hanks into their boiling recesses. When he raised them they had turned from pale yellow to a luminescent acid green. Open pots of tincture lay on a table and Mr Roger would add the merest shred, by eye, to change a tone. He showed us a painting that he had been sent to match, his visual repertoire so acute that he could reproduce the colours exactly in wool. We bought some yarn from his tiny shop with its enticing rainbow shelves, and were surprised to learn that it is spun from Australian and New Zealand merino. Our next visit was to the garden of a property high above the town where Susanne had her conservation studio. The building was most interesting - it had been a famous 19th C. tapestry and carpet weaving manufactory and sits in a delightful, walled garden full of old roses. The tapestry workshop was last owned by Suzanne Goubely, who worked with a famous tapestry designer of Aubusson, Dom Robert, who was also a monk. We unpacked our lunch and sat in a circle on pieces of garden furniture, a good opportunity for everyone to get to know Susanne. Upstairs, her textile conservation studio is housed in a large room that still has old looms and hanks of wool left over from its previous life. Susanne showed us her latest tasks in hand, a tapestry dating from the 1950s that was an abstraction of Uccello's The Rout of San Romano that needed extensive cleaning, and a quite crudely woven 17th C. tapestry that had been badly stitched together. Our final destination that day was the former Musee Departmental de la Tapisserie that has been absorbed by the Cite Internationale de la Tapisserie et de l'Art tisse. Established as the heart of the project to oversee the revival of Aubusson tapestry, it will be relocated in 2015 to the Ecole Nationale Superieur des Arts building once it is renovated. We were shown around a special exhibition by the curator, Bruno Ythier. Entitled Tapisserie Art Deco, a L' Exposition Internationale, Paris, 1925, it occupied most of the gallery space. Concentrating on the tapestry exhibits at the Grand Palais in that year, the settings of chairs, carpets and wall decorations had been faithfully reassembled with the help of the Mobilier Nationale in Paris. All the work had been woven in Beauvais, Aubusson and at the Gobelins. Highly figurative, it bore more relation visually to Art Nouveau and the Pre - Raphaelite aesthetic rather than the clean, decorative lines to which we accord the name Art Deco. Romantic trysts in enchanted forests and anthropomorphised animals abounded. Mr. Ythier gave us an animated description, Susanne translating all the way. 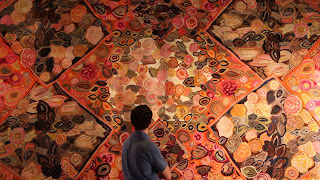 The exhibition culminated in a room of Aubusson student work of the era. An innovative teacher at the time, Antoine Marius - Martin had insisted on dispensing with highly detailed, painted colour cartoons and had gone back to using simple, black and white line drawings to encourage the students to find weaving solutions to their interpretations. A course of action that Archie Brennan would definitely have approved of! Unfortunately a difference in the results were not altogether apparent. Each year the Cite runs an International design competition to foster innovation in tapestry and we were able to view the design proposals and the tapestry samples of the winners in the past two years. In 2011 I was also fortunate to visit the studio of master weaver Benard Battu as he worked on one of the winning designs by Olivier Nottellet, a graphic work in three colours with allusions to a mysterious landscape, and Patrick Guillot as he wove Peau de Licorne by Nicolas Buffe. These works will form the core contemporary collection of the Cite and act as a drawcard to encourage further International commissions from Aubusson weavers. We returned to the Manoir quite sated, and looking forward to the lovely meal that Valerie would prepare for us that evening.